Eric N. Mack’s paintings and sculptures assemble sundry found materials with traditional media to establish a complex dialogue between material and subject that questions existing definitions of form, function, and style. 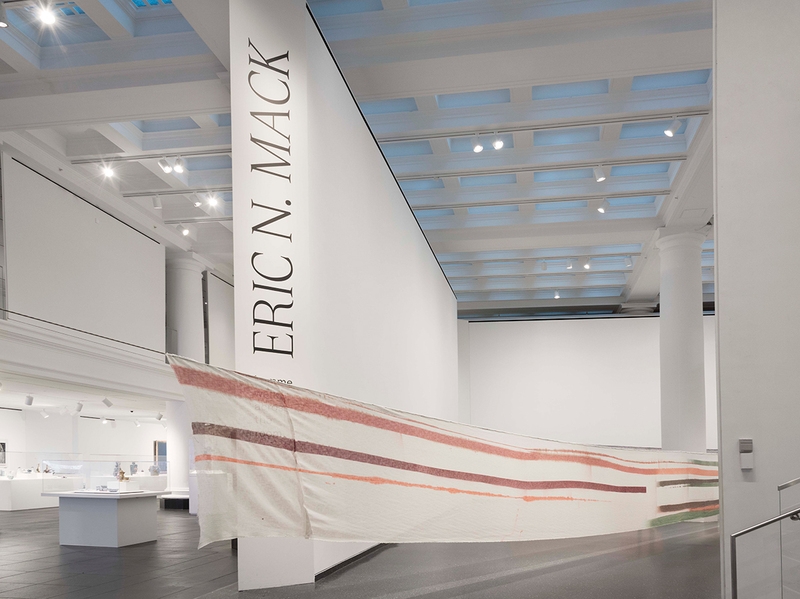 Following solo exhibitions at Albright-Knox in 2017 and Simon Lee Gallery in 2018, Mack was invited to transform the Brooklyn Museum’s Great Hall with a site-specific installation of his textile-based works. 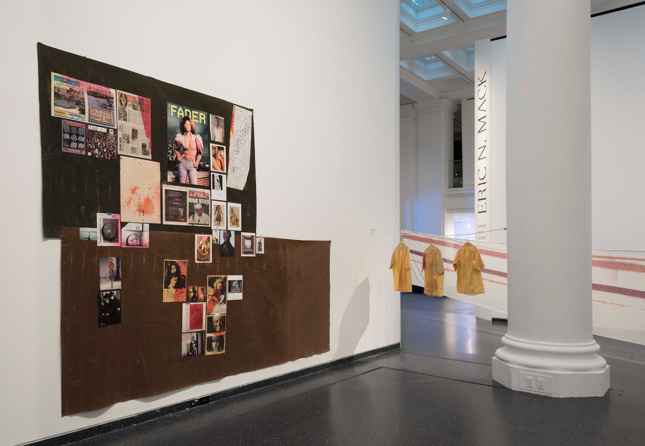 The result, Eric N. Mack: Lemme walk across the room, invites a discussion on the fundamental components of aesthetic vision and the mercurial relationship between visual culture and everyday life. 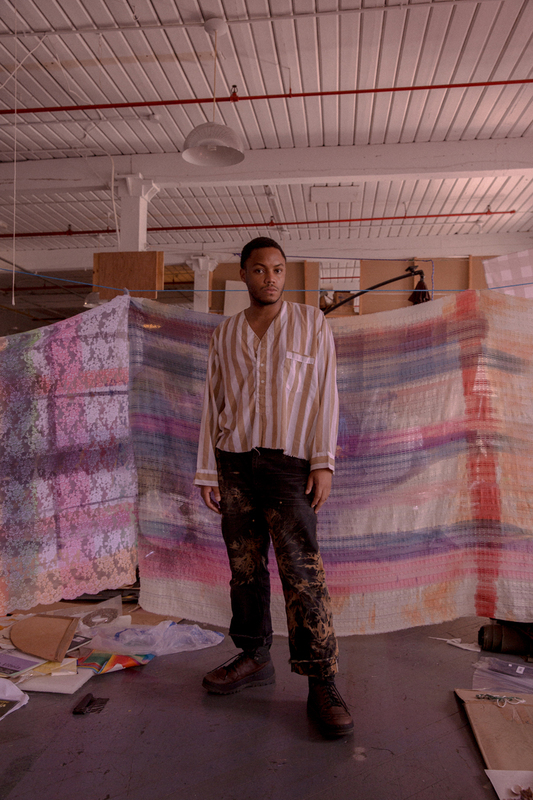 Positioned at the intersection of art, fashion, and architecture, Mack’s work reveals an array of unexpected connections and contradictions. A discussion with the artist on the installation and his practice provides a glimpse of his creative processes and wide-ranging interests. The Architect’s Newspaper: Were you responding to specific elements of the classical architecture of the Great Hall? Eric N. Mack: Yes. The space has no corners. So, I felt like I wanted to build a painting structure that would embrace this architecture, that would be contingent on the architecture, and would change the way that people engage in the space and see the space from a given vantage point. But I chose the fabric because it was slightly transparent, so it wasn’t about opaqueness, or an immediate opaque gesture, but rather a gesture that deals with transparency in the space. So I was thinking about an overlay or patterns that could flatten out as a decorative point, but through their depth create some markers of distance and closeness. AN: In a lot of your past interviews and articles on your work, the authors always talk about how you grew up in Washington, D.C., and went to the National Gallery all the time because your parents worked there, and I thought it was really fascinating that your dad built vitrines and was an interior designer for the exhibitions there. Did that have any impact on your process for creating this work? EM: I mean I think there’s a lot about…generous museum experiences. And how those moments really resonated with me, not necessarily just at the Brooklyn Museum but any museum experience. I’m just thinking about an exalted moment of viewing artwork. Some of the most dynamic experiences had to do with really feeling the length of the room and really understanding the impact of my body in the space as a viewer. Almost like a dream—like a way of seeing an artwork that is almost in between installation [and painting] or something like that. So you end up really focusing on this moment of engaging points of measurement or exchange between you and the artwork. AN: Yeah, that sort of leads to my next question, which is about the title; obviously it’s an imperative for you to follow along the boundaries of the white, horizontal paintings, but it also sounds like a larger, more conceptual grounding for the entire installation, and maybe a specific aspect of your practice, in a way. Would you say that’s a correct reading or is there another reason you felt that title was the most appropriate? EM: When I choose a title there are probably at least four different ways that point me to that place again and again. First, I wanted there to be almost a performance prompt for the viewer. But it also has this personalized position in which people have to determine whether it’s about me or it’s about them. And maybe it’s about both of us. [It’s also about] questioning frameworks, breaking down frameworks and creating new ones that are maybe less familiar. But I also love that [the title] almost alludes to a runway show, at the base of it. The fact that there will be a personal impetus for a runway show or catwalk show. And that’s something that I’m still unpacking. AN: You also have a very strong collagistic impulse. Why do you find it necessary or how would you describe it? 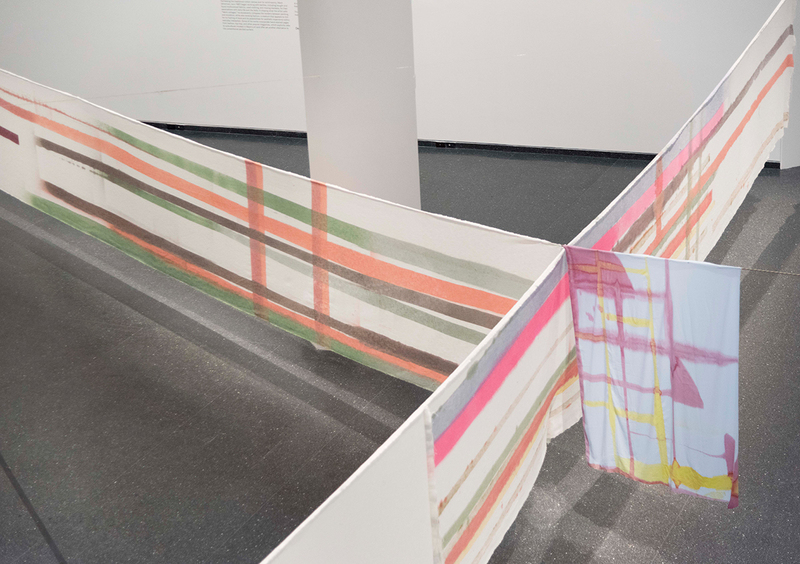 EM: I think this show deals in collage in many ways…I think garments are naturally related—or congruent—to collage. The intention around stitching or the suture ends up being a possibility for a felt, dynamic place of legibility. It ends up being a space that is specifically about the reconstruction of form, and maybe a critical deconstruction in a way, for the moment of reconstruction. So, there are several different points that I think speak to a linked or connected language. A lot of times I feel like the properties of a work have to be turned inside out to understand what they are presently, and what they were. So, I think to be able to show that I think is a really generous end or offering to the viewer. AN: So this question may or may not be interesting, but when I went, there was a guard standing right in the middle of the installation. Do you have any thoughts or feelings about that? I assume you didn’t have too much say over their presence. AN: But I still felt their presence still as I was moving through. EM: Me too, actually. Yeah, that’s always an equation that could easily be overlooked. 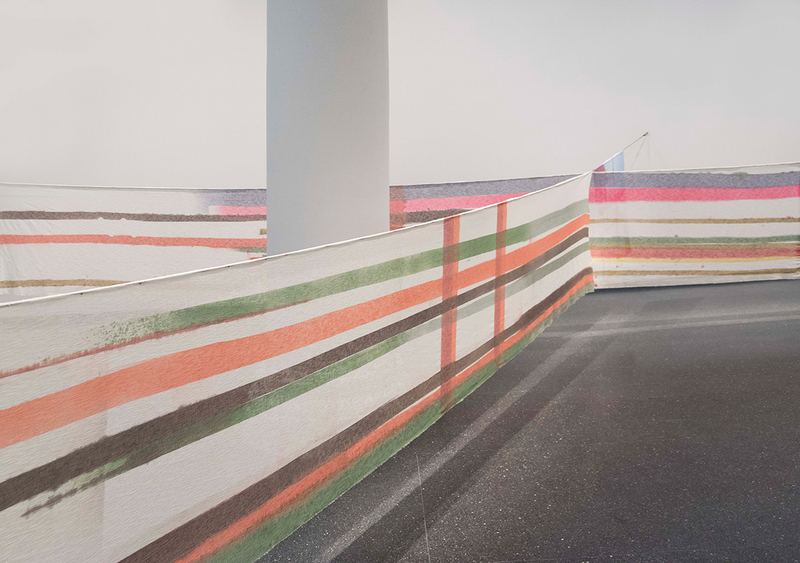 Even by the viewers themselves, the fact that there are people who could potentially be experts in the work besides the artist, the security guards—if they’re paying attention, [and] I’m sure they are. AN: Did you use any specific elements to the large collage on the right wall specifically for this show? Or was it kind of an assemblage you already had? Kelis stands out to me. AN: I mean Kelis is associated with New York, but not all of the elements are. EM: Exactly. And I love that because it’s really about a time and space. I mean I talked about them before as hyperlinked material images. But there’s a lot of ways to read it. There’s a kind of elegy to Phoebe Philo, Céline. The title is Tartan Film Strip from 1987 Till Recent. And thinking about the space of the grid as being the space of representation first and then it also being a place for points of reconnection, dislocation, or rupture, basically. AN: Yeah, which is a very painterly concept I feel like. I know you’re a painter. EM: Yeah, or that definition, all the time. But yeah, I think the narrative of the piece generally has to do with points of comparison. Somehow below the horizon line there’s a lot more vintage materials. Some of the images are from Interview magazine from 1987. AN: Which is the year you were born. EM: Exactly, yeah. There are these archetypal ways that these women were being photographed, that fashion existed within the image but it was mostly about their gaze and their contact. AN: How they were presenting themselves. EM: Exactly. I mean like Janet Jackson definitely—the album called Control is very much about one’s authorship in [their] control of their career, their bodies. AN: Do you ever put in personal effects? Was there a picture of you? EM: Yeah. It’s from the first time I went to Europe and I was 14. But it also sits on the opposite end [of the collage] as Isa Genzken, an image of a sculpture she made [Slot Machine, 1999–2000]. And that was kind of a point of validation for me, with her portrait—there was definitely a way and a manner to the work that I feel like could relate to Isa’s work. And I didn’t want to diminish that or go away from it, but perhaps use it as content. Isa’s last show [Isa Genzken: Retrospective (November 2012 – March 2014) at the Museum of Modern Art, New York] was also sponsored by Céline. AN: Oh really? I didn’t know that. EM: And I always loved that because I felt like they’re adjacent. Like, there’s these two adjacent industries that end up supporting one another in various ways that are highly aesthetic. Eric N. Mack: Lemme walk across the room is on view at Brooklyn Museum through July 7.